Add about 4 cups of water and pressure cook the rice and dal together. Heat ghee in a pan and add cumin seeds, pepper, curry leaves, green chilies and asafetida. Remove it from the stove when you smell the aroma of the ingredients in the melted ghee. Now add cooked rice + dal and salt with it. Serve hot pongal with sambar, chutney or godju (aka godsu). Nice combo..looking delicious anu..yes anu chutney with not taste good with flakes..i am getting fresh coconut in mexican and chinese stores these days..
Wow.. looks yummy & delicious..
Nice breakfast dish Anu! I just love it… Yours look so yummy! Venn Pongal… my all time favo. well said about Coconut chutney. They taste very bland here. Ur combo is perfect. Best combo ever.. Very comforting! Pongal is my fav,but i love the way my mom makes it,she makes it sarvana bhavana style. 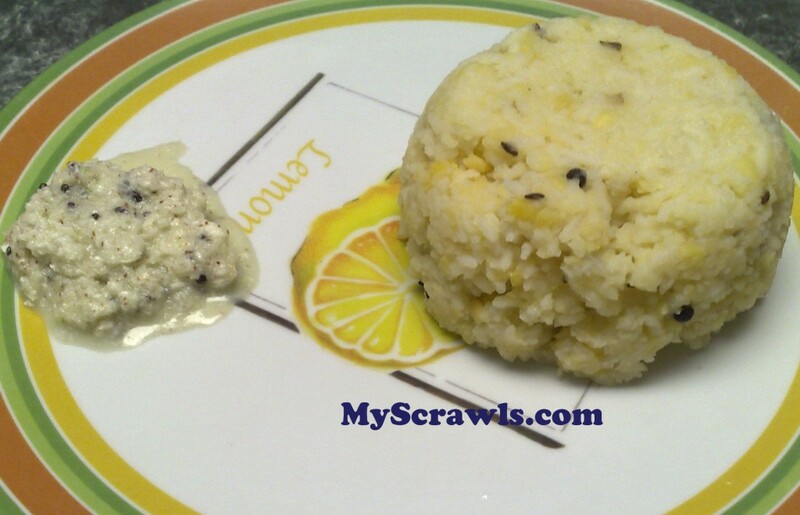 Hi Anu, pongal looks really delicious! I always wanted to try this dish, ur recipe looks easy. I have just recently started a blog, do visit sometimes and would make my day if u leave some comments. ur blog is very impressive in terms of page design and readability factor. Keep up the good work!! I find that I have to add a lot of water. Otherwise the Ven Pongal becomes like glue (too solid). I am also surprised that 1 cup of moong dhall for 1 cup of rice works for you. I use not more then 1/3 cup of moong dhall for 1 cup of rice. I was searching for a good pongal recipe since early morning….and this version gave me satisfaction. Thanks for the lovely comment Divya Glad u liked the recipe. Do try out and let me know. Thank you for the feedback Really appreciate it! Hope you had a wonderful thai Pongal.